To Stay In Lican Ray? 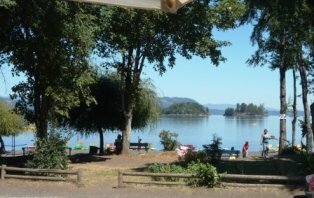 So let me tell you why Lican Ray is a must see in Chile. This little town is one of the main reasons why I started this web site. I want to tell as much people I can about it because for some reason people don´t write about it a lot in the travel books and people in Chile don´t pay much attention to it. But think it´s a must see and everyone who comes to Lican agrees with me. 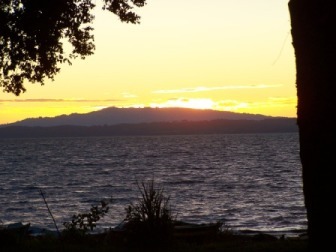 You see Lican Ray is a town that hasn´t been touched by the modernization yet. There is a lot of vegetation around and the roads aren´t even paved. So when you´re there it´s like going back in time. You also have time to bond with nature, for those of you who like the outdoor activities. 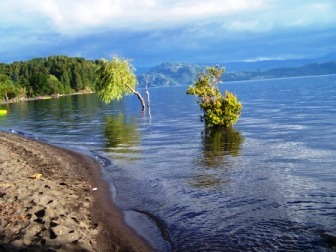 Lican Ray is on the shores of Calafquen Lake and it is located about 28 kms from Villarrica. It has two beaches, called Playa Grande (Big Beach) and Playa Chica (Small Beach). When you drive into Lican, the main road is paved (it´s the only road that´s paved), and you drive to the end of the road, you end up at the Playa Chica. This is a small beach that is mostly used to dock motor boats because it gets deep really fast. If you walk to one of the ends of the beach (the closest end) you find a peninsula that is very beautiful to take a small hike to.This run by the Mapuches and there is a small fee to pay, but it´s worth it. Once in the peninsula you´ll find a lot of small beaches that are very beautiful. 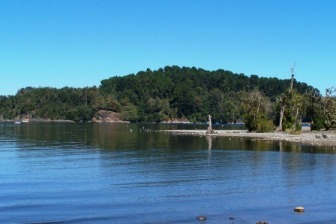 Playa Grande is located from the paved road to the right (if you come from Villarrica) on a road called Cacique Punulef. This is a beautiful dark sanded beach. On the shores of the beach you can find boats, water bicycles and canoes for rent. For those who like to fish you can rent a boat and hire the boat men to take you out fishing, and they know all the good spots. Most of the fish that come out of this lake are pretty big. There are also boat tours that coast about $2-3 US dollars to go out around the lake. 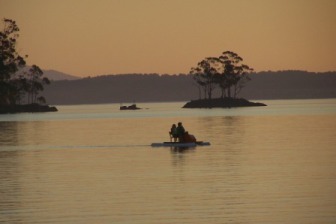 The best time to visit Lican Ray is during December and March. Summer is in between these months and there are to many people around at the beach to appreciate it. But it´s better to come than not see it at all. If you´re looking to stay a couple of nights the best place to stay at is a small in called Hosteria Inaltulafquen. It is located on the shores of Playa Grande on Cacique Punulef street (number 510). To read more about this cute little inn, click here . Or to get in touch with them click here and I´ll help you out. It is run by the owner who speaks English and does most of the cooking. I assure you it is one of the best places to eat in Chile and the service is very personal and hospitable. If you don´t believe me look it up on Lonely Planet. If you visit in a car you can go to Coñaripe that is near by then to the hot springs for the day. Or go hiking up the Villarrica volcano on the side that isn´t very explored. These are just some of the things you can do. Just a little advice though, if you´re looking for night life and parties, I´m sorry to tell you this isn´t the town for you, but if you like to hike and get in touch with nature, PLEASE don´t leave Chile with out coming to Lican Ray. Any Questions? Ask me by clicking here.